Paring Knives for Restaurants and restaurant kitchens come in durable stainless steel. These restaurant paring Knives are strong and durable for busy commercial kitchens and are used for light chopping or slicing of small items like garlic or parsley. Buy your wholesale paring Knives here at the restaurant supply superstore. We stock catering paring Knives from top manufacturers like Forschner and Russell Harrington. Paring knives are also great for cutting or peeling apples, kiwis and other fruits. Forschner Molded Handle Straight Edge Parer Knife - 3.25 in. 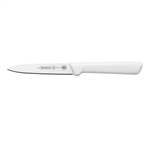 Forschner Molded Handle Wavy Parer Knife - 3.25 in. Forschner Rosewood Handle Curved Point Paring Knife - 2.5 in. Russell Cooks Style Parer Knife Black Handle - 3.25 in. Russell Clip Point Parer Knife - 3.25 in. Russell Scalloped Tapered Parer Knife - 3.13 in. Russell Parer Knife Black Handle - 2.75 in. Russell Cooks Style Parer Knife - 3.25 in. Russell Parer Knife Black Handle - 3.13 in. Russell Clip Point Paring Knife - 3.25 in. Russell Clip Point Paring Knife - 3 in. Russell Tapered Point Paring Knife - 3 in. Russell Paring Knife - 3.5 in. Russell Scalloped Parer Knife- 3.25 in. Buy your restaurant kitchen paring Knives from the leader in restaurant supply smallwares. Your chefs and staff will appreciate these knives.